A few years later using his special powers, Mikey Mann found an unprecedented warming trend since 1850 – which NOAA had been unable to see any evidence of just a decade earlier. Government scientists made the magical transition from “no 20th century warming” to “unprecedented 20th century warming” – in just one decade. 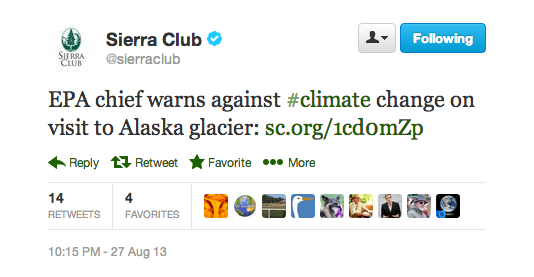 EPA and Sierra Club Climate Change Deniers? PORTAGE GLACIER, ALASKA — As she marvelled at the site of a shrinking Alaska glacier, the newly installed leader of the Environmental Protection Agency said Monday that the president told her that fighting climate change should be her primary focus. “The president’s main priority for me was to recognize when I was coming in here that this is going to be a significant challenge and one in which the administration was going to begin to tackle,” said EPA Administrator Gina McCarthy. Only a complete imbecile (i.e. Barack Obama) would believe that he could stop interglacial processes which have been going on for 20,000 years. As you enter Glacier Bay in Southeast Alaska you will cruise along shorelines completely covered by ice just 200 years ago. Explorer Captain George Vancouver found Icy Strait choked with ice in 1794, and Glacier Bay was barely an indented glacier. That glacier was more than 4000 ft. thick, up to 20 miles or more wide, and extended more than 100 miles to the St.Elias Range of mountains. By 1879 naturist John Muir found that the ice had retreated 48 miles up the bay. By 1916 the Grand Pacific Glacier headed Tarr inlet 65 miles from Glacier Bay’s mouth. The glacier that filled Glacier Bay during the Little Ice Age began its retreat from the mouth of the bay more than 200 years ago and has exposed a magnificent fjord system about 100 km long. The massive glacier retreated past Sitakaday Narrows ~190 years ago, retreated past Whidbey Passage ~160 years ago, and reached the upper end of the main bay by 1860 (~140 years ago). There the glacier bifurcated and the multibeam data set terminates. The amount of fine sediment reaching the lower bay is largely restricted to local runoff and plankton debris. In addition, the currents through Sitakaday Narrows can be as fast as 7 kt, scouring the bottom of fine sediment. So a long history of morphologies is clearly visible on the bottom. 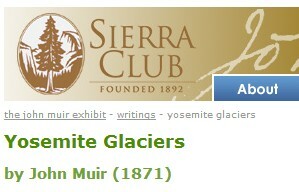 Are Sierra Club members aware of the extreme glacial retreats and significant climatic changes observed by their founder John Muir in the 19th century? Or like all global warming cult members, are they brainwashed into believing that the climate began in 1976? 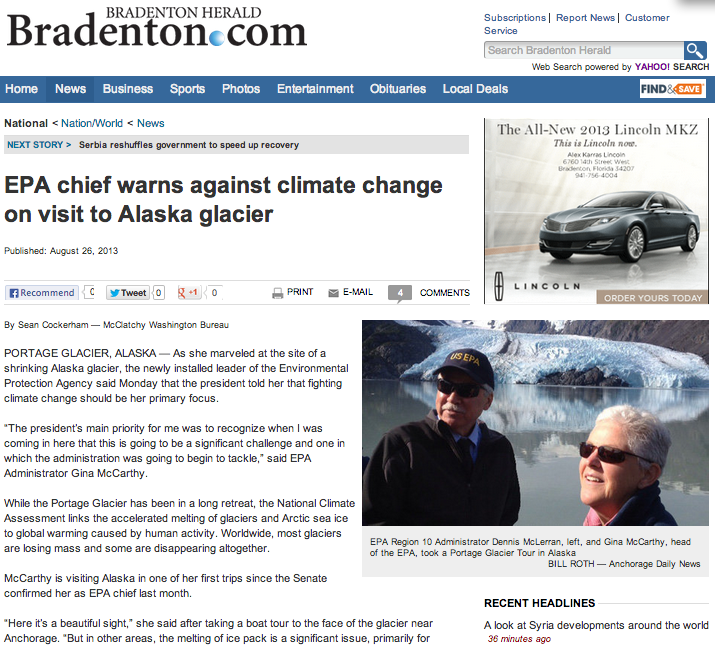 It must have been Fred Flintstone’s SUV that ruined the glaciers. in my opinion future investigation will uncover proofs of the existence in the earlier ages of Sierra Nevada ice, of vast glaciers which flowed to the very foot of the range. Already it is clear that all of the upper basins were filled with ice so deep and universal that but few of the highest crests and ridges were sufficiently great to separate it into individual glaciers, many of the highest mountains having been flowed over and rounded like the boulders in a river. Glaciers poured into Yosemite by every one of its cañons, and at a comparatively recent period of its history its northern wall, with perhaps the single exception of the crest of Eagle Cliff, was covered by one unbroken flow of ice, the several glaciers having united before they reached the wall. Obama calls people climate change ‘deniers’ because he wants to prove to the world and his estranged father that he and his unelected eco-fascist EPA, armed with economy wrecking draconian emissions controls, can change the climate and stop the interglacial process which has been going on for 20,000 years. 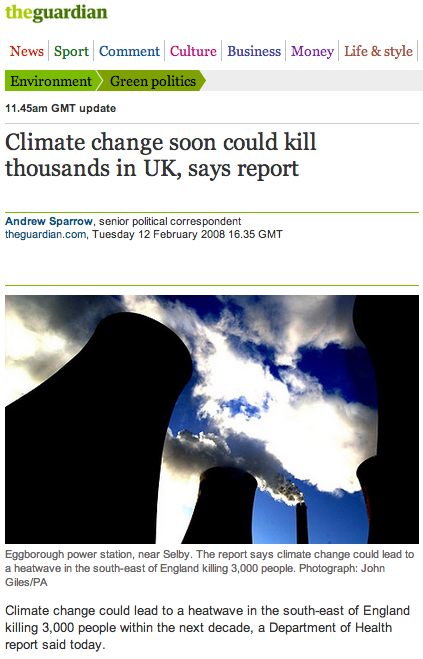 “Coal makes us sick. Oil makes us sick. It’s global warming. Heat related deaths as a result of increased greenhouse gas emissions leading to Global Warming are completely unsubstantiated by empirical evidence. In fact studies show the opposite is true. The following table from Goklany (2007) provides a breakdown of mortality due to the major types of extreme weather events for 1979-2002 based on data from the CDC database for extreme cold and extreme heat, and various arms of the National Oceanic and Atmospheric Administration for floods, lightning, hurricanes, and tornadoes. 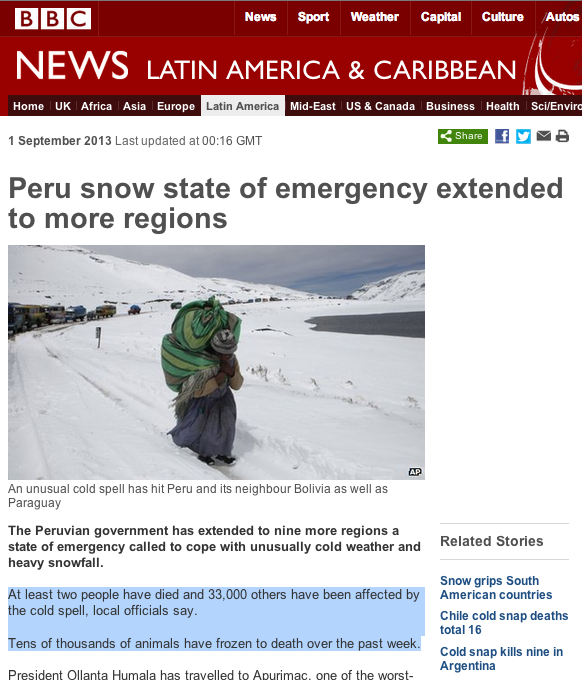 It indicates that extreme cold, rather than heat, is the deadliest form of extreme weather event. In fact, over this period, extreme cold was responsible for slightly more than 50 percent of deaths during this period for the categories listed in the table. Note that despite the hoopla about natural weather disasters, they contribute less than 0.06% to the annual U.S. death toll! Moreover, as the following figure, also from Goklany (2007), shows, both US death and death rates from weather events are declining, despite any climate change, which we are assured can only make matters worse. 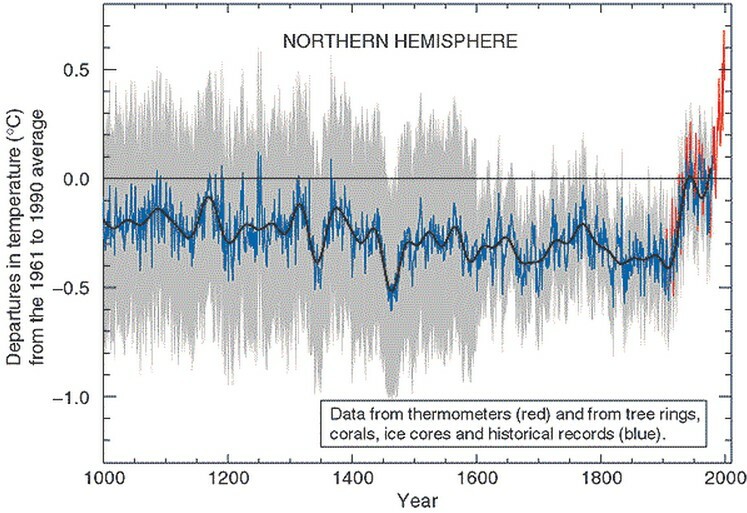 Of course we all know that the human race has historically done better during warm periods. While we’ve seen a sloght warming in the last century, we’ve also seen a worldwide improvement in the human condition. Warm – what’s not to like? Despite record output of industrial emissions over the past 15 years, there has been no Global Warming, at all. In fact, since around 2002, there has been a measured cooling trend across all key data sets of around 0.07°C or 0.77°C per century. Though this cooling is statistically-insiginficant, it highlights the epic failure of the IPCC and the ability of their billion dollar state-of-the-art climate models to forecast climate change, and the sheer insanity and costly danger of 97% of the world’s ‘expert’ scientists making alarmist forecasts and scientific reporting based on 73 overheated CMIP5 climate models. 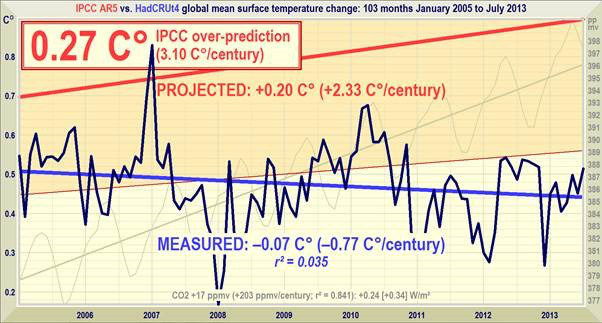 The economic dangers associated with Governments implementing draconian climate policy based on unverifiable predictive models which do not accord with observed reality, needs no further explanation. 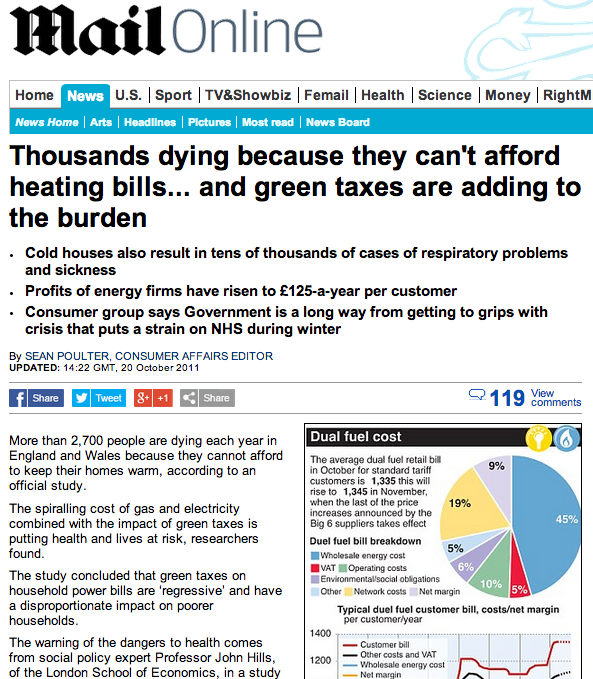 Afterthought: Despite literally trillions of dollars gulled from taxpayers, spent on inane and insane climate fixes and despite all the propaganda, lies, spin and hysteria trotted out daily by Government, vested interests and compliant media …. a new Nature Study Confirms Global Warming Stopped 15 Years Ago. When can we start spending other peoples money on important things like medical research, fixing real pollution, stopping the decimation of rain-forests for biofuels or providing cheap, reliable electricity to the 1.3 billion people who don’t have any? 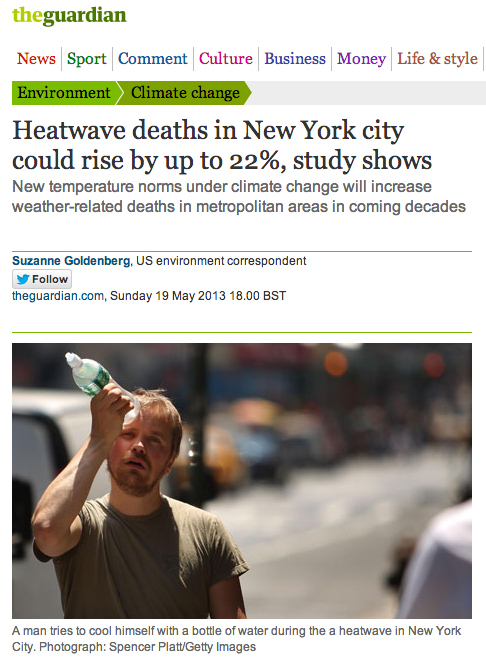 Does Hot weather or cold weather cause more deaths? Keep Your Long Flannel Underwear: Climate Scientists Predict Hell To Freeze Over! Detailed satellite measurements of glaciers and ice extent only began after 1979. We therefore only have 34 years of satellite monitoring to base detailed observations on. 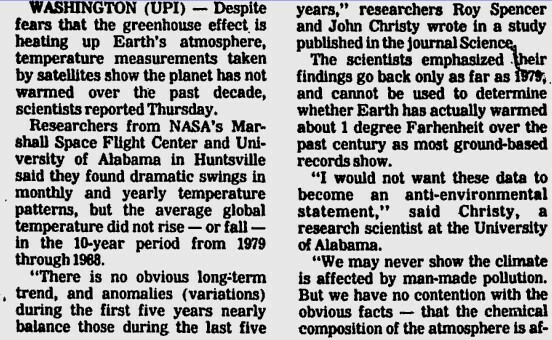 For historical climate perspective we have to rely on literal first-hand accounts and observations for any time before 1979. 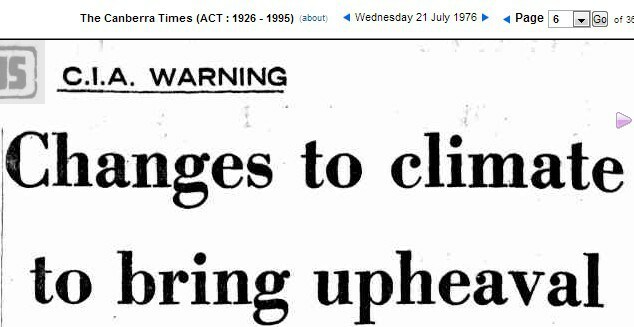 Is the decline of Arctic sea ice extent from the century maximum of 1979 and glacial retreat in some areas, proof of ‘man-made’ global warming? Historical records tend to disagree or show similar, if not much warmer periods and greater melt occurrence throughout our history. 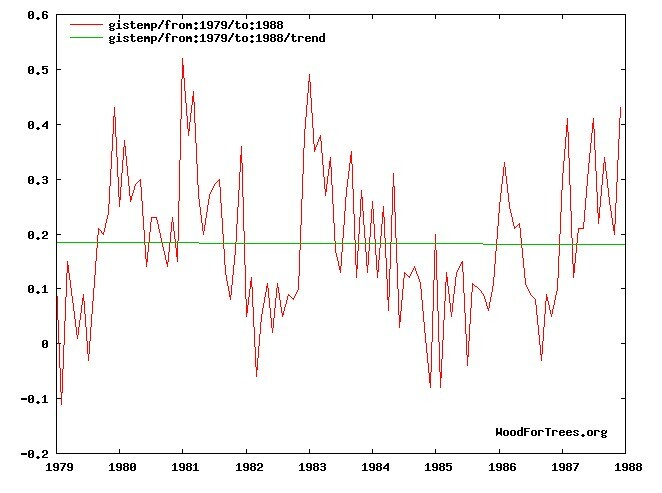 AGW climate alarmists will scoff at this list, because they like to believe the climate started in 1976, when the planet came out it’s 1945-1976 cooling phase and began the supposed ‘anthropogenic’ warming phase, until all that warming came to a grinding halt in 1998. 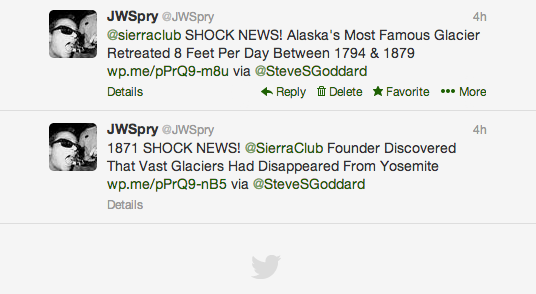 Lots of comments today from people whining about man-made glacial retreat. I assume it is an organized event, so let’s just put it to bed right now. The current Greenland warming, while not yet quite matching the temperatures of 70 years ago …..
CLEVELAND, Feb. 16 (A.A.P.) Dr. William S. Carlson, an Arctic expert, said to-night that the Polar icecaps were melting at an astonishing and unexplained rate and were threatening to swamp seaports by raising the ocean levels.